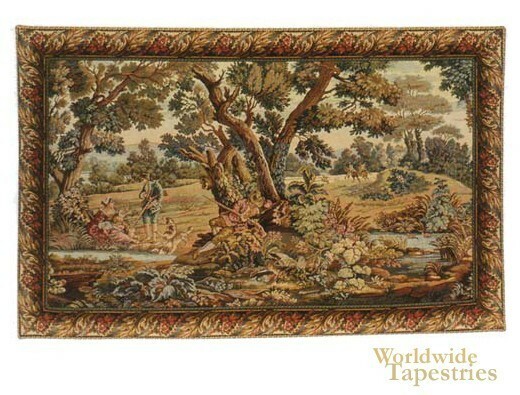 Like its companion tapestry, this "Hunters Resting" tapestry shows a verdure scene inspired from the French and Italian verdures from the 17th century. Here in this scene we see a hunting party resting by the river bank. We see a lady among the party, as well as their hounds used for hunting in the 17th century Europe. A second group of hunters are also seen in the background. The beauty of the detail in the foliage of the verdure can be seen here, from the browns of the bark to the sophisticated blue greens of the foliage, contrasting warmly and beautifully with the golden and olive green foliage of the rest of the scene. This landscape verdure tapestry "Hunters Resting" is backed with a lining and has a tunnel for ease of hanging. Dimensions: W 54" x H 35"
Dimensions: W 66" x H 46"